Six year old Jonty from Welwyn has quadriplegic cerebral palsy and epilepsy and relies on a wheelchair for daily activities. 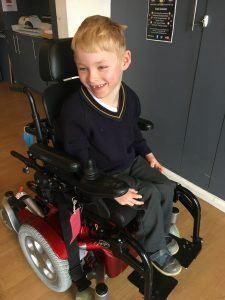 The physical design of his local school made moving around difficult and this new power chair allows Jonty to access all the activities on offer to his age group. Elifar pledged £3,000 to fund the £7,500 chair alongside two other charities. The indoor/outdoor chair gives Jonty real independence and also has a lift and tilt facility to reach various table heights at school and helps Jonty to be at the same level as his peers.